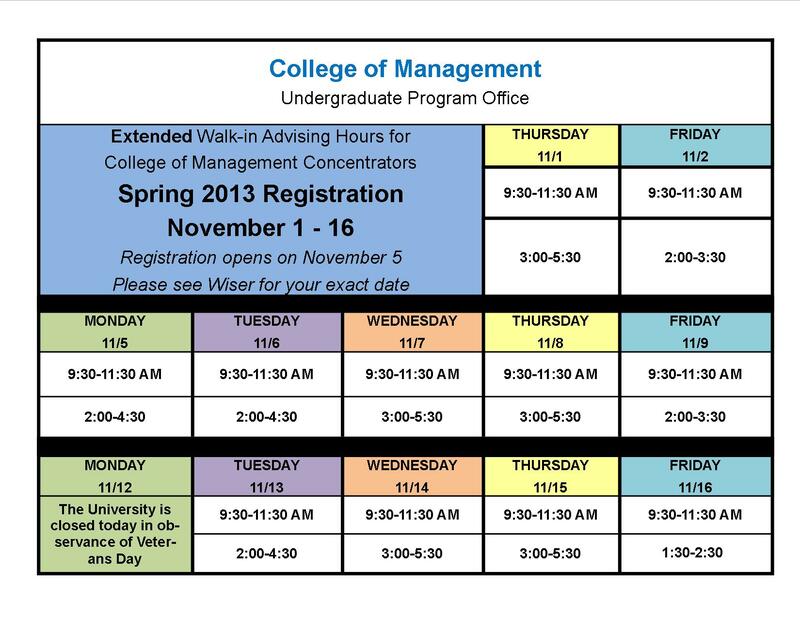 The College of Management will be available for extended Walk-in advising for Declared Concentrators from Thursday, November 1st – Friday, November 16th. 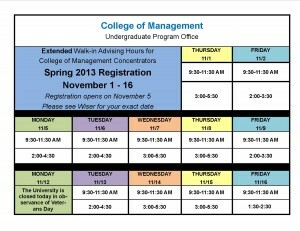 Please review the following schedule and find a time to come in to plan for Spring 2013 courses during this time. As it is in the middle of the Registration Period, if you have additional questions that are not time sensitive about Registration, please plan to come to walk-in advising after November 16th. The CM Undergraduate Program Office will be adjusting walk-in hours this afternoon. An advisor will be available for walk-ins from 3:30 – 5:00 pm this afternoon. Morning walk-ins are still available from 10:00 – 11:30 am today. Comments Off on Ready, Set, Placement Test! As you start to think about your spring 2013 schedule, you should also be sure that you have completed all necessary placement exams. Because Spring 2013 registration is around the corner, you will need to make sure you have the appropriate placement before you can register for certain courses. 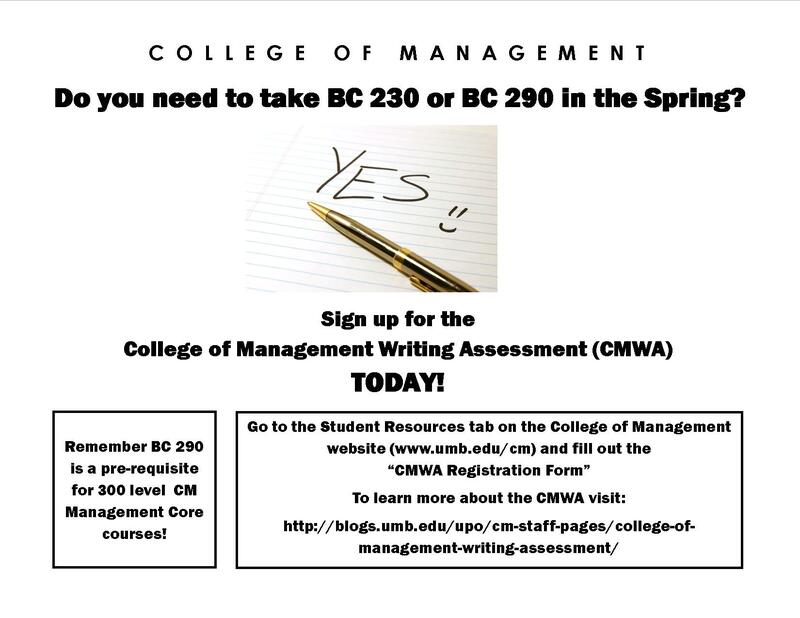 If you plan to take either BC 230 or BC 290, you will need to take the College of Management Writing Assessment (CMWA). If you plan to take your first math course at UMB, or your first math course in over a year, you will need to take the Math Placement Exam (MPE). Your MPE results will expire within a year, so if you took the test, but did not take a course, a more than a year has passed, you’ll need to retest. If you plan to take a foreign language course, you may also need to take a placement exam. It is wise to consult with the department offering the language to assess if you need a test, and which test to take, especially if you have any previous experience of any kind with the language. If you are specifically interested in the Spanish Placement exam, please visit this site. The CMWA, MPE and Spanish placement exams are offered through the UMass Boston Testing Center. Stop by the College of Management Undergraduate Program Office (McCormack Hall, fifth floor, room 610) during these times to get your MAP ID. It is quick, easy, and helps us make sure you are getting all your MAP Miles. As a CM student, you may be enrolled in MATH 134 (Managerial Calculus) or another course that leads up to MATH 134, depending on your math preparation before entering UMass Boston. Many students can find math a challenging subject to master, and utilize resources such as Professor Office Hours, the Math Resource Center Workshops or one-on-one tutoring. If you aren’t utilizing these on campus resources and are feeling lost or behind in your math class, you should start reaching out for help on campus now. It is not too late to ask for help. If the on-campus resources aren’t enough for you, look online! One website that can help is the Khan Academy. The Khan Academy is a free website with a large collection of educational tutorial videos. The videos vary in length and walk you through specific topics and subtopics in many subjects, including math. There are even ways to practice the material online and track your progress if you choose create an account. The Khan Academy is a general resource used around the world and not specific to UMass Boston courses or course content. You may find some areas of the website more helpful than others because it is a general resource. The online tutorials could, however, be another way to supplement your on-campus support to help you succeed in math this semester. The MAP-Works Survey helps you and your advisors understand the elements that impact your social and academic success here at UMass Boston. The University has invested in this program as a tool to help aid in student success – but we need YOUR input to make it as effective as possible here at UMass Boston. On October 1, all students were emailed a link and information about this survey, requesting that it be completed by tomorrow, October 15, when it closes. 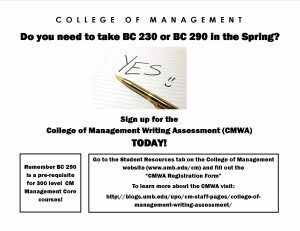 When you link to the survey, you should use your full UMass Boston email address with @umb.edu and password to log in. The survey will only be available October 1-15, 2012 – so you are encouraged to take the survey NOW! You will be entered in a raffle to win Priority Registration for the Spring 2013 semester. Twenty students will win a chance to register for spring classes before anyone else – and you know how those CM classes can fill up! You get 25 MAP Miles. This might not sound like a lot, but when you calculate 75% of you miles, you may find it comes to an odd number – and these 25 miles might make the difference you need to reach this requirement. If you were a student who took this as part of the pilot launch in the spring 2012 semester, you should still take again now. Orientation Leader applications are due, along with a copy of your unofficial transcript, to the Office of New Student Programs (Campus Center, 2401) or Office of the Dean of Students (Campus Center, 4th Floor) by tomorrow, Friday October 12, 2012 at 5:00pm. We hope you will consider applying for this exciting opportunity! The Reading, Writing and Study Strategies Center will be offering Note Taking and Study Strategies Workshops this week. Due to the the Accounting, Finance and Business Career Fair, the Undergraduate Program Office will be available for walk-in hours from 2:00pm – 3:00pm on the afternoon of Wednesday, October 10, 2012. This is a small adjustment in our regularly scheduled walk-in hours. Please continue to check the Walk-in schedule page on the blog for our recurring walk-in hours. Comments Off on So What is MAPWorks? The MAP-Works Survey helps you and your advisors understand the elements that impact your social and academic success here at UMass Boston. The University has invested in this program as a tool to help aid in student success. On October 1, all students were emailed a link and information about this survey, requesting that it be completed by October 15, when it closes. Note: Despite the similarity in names, this survey is not related to the College of Management’s Management Achievement Program (MAP). Help us help you: Survey results will help advisors and administrators assess trends in student needs which may serve as guideposts to developing additional resources for success. Help yourself: The Survey will give you and your advisor insights to your goals so we can develop a plan together to help you stay on track reaching them. If you take it during the Accounting, Finance and Business Career Fair on October 10, 2012 – you can be an instant winner and walk away with a cool gift from the College of Management.